Often thought of as a vegetable peas are actually a fruit, the peas themselves the seeds of the fruit. A quintessential British treat in the summer months peas start out as sugar snap peas or mange tout when harvested before growing into the summer garden peas that we are most familiar with. Dried and halved we are left with split peas most often used in winter soups with ham. Peas have a relatively short season in the summer months of the UK. Look for pods with crisp shells that are bursting with fruit. Frozen peas are an acceptable substitute for fresh as they are usually frozen within 30 minutes of being picked and therefore the freshness and flavour is well preserved. Peas can be eaten raw or cooked. Split the pod and run your finger down the shell to release the peas. The most simple cooking method for peas is to simply blanch in salted boiling water, they will take no more than 2-3 minutes to cook. 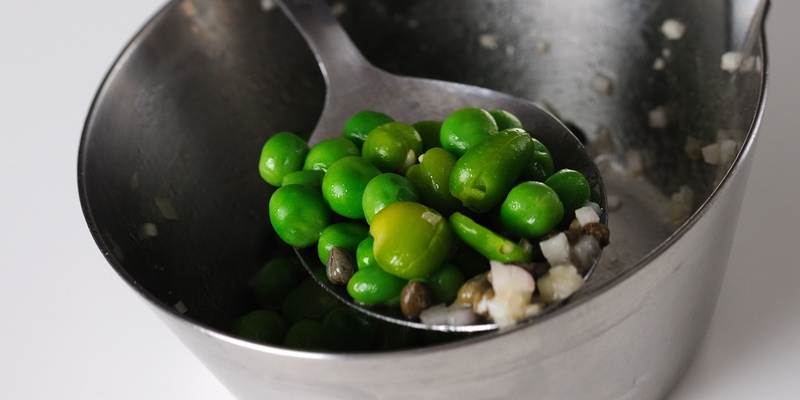 Peas can also be eaten raw in salads or cooked and blended into a puree or summery soup. The shells can be used to make a tasty stock. One of the most British preparations of peas is mushy peas. Peas can be a great ingredient in a simple summer salad pairing with asparagus, broad beans, radishes and baby carrots. Graham Campbell makes a pea mousse to compliment his Alaska salmon and sauce vierge. Alyn Williams uses peas as the key ingredient in his risotto, while Daniel Clifford makes a pea veloute and serves with an Asian inspired dashi jelly.